Cities need to change direction fast, if we are to satisfy our needs and retain social values. As the world tips towards the East, and to ‘mega cities’ of more than 10 million inhabitants, countries such as the UK need to offer better models for how to manage growth. As capital has been growing at twice the rate of income for many decades, according to economists such as Thomas Piketty, the worst side effects are being felt by the young and the poor, who feel squeezed out. But we all complain of congestion, pollution and stress, despite the promised benefits of the Digital Revolution. What is to be done? Our earliest work was the adaptive reuse of old buildings, then the promotion of small enterprise and the revival of town centres, but for over a decade we have concentrated on housing. In 2014 we won the Wolfson Economic Prize for showing how to build garden cities that were visionary, viable and popular. Our test case was doubling the size of Oxford, which is stagnating due to the shortage of affordable housing. The key was applying Ebenezer Howard’s original model for garden cities, which he called the Social City, to fund infrastructure through land value uplift – ‘the unearned increment’. 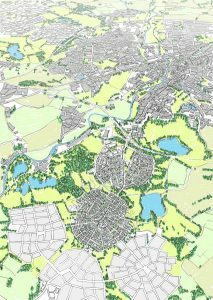 Our report on an imaginary city Uxcester Garden City (www.urbed.coop) proved it was possible to fund new tram lines and country parks to tackle congestion and flooding if land on the edge of the city were developed on our garden city model. Land owners such as colleges would receive ten times but not a hundred times the current value of land in agricultural use. The ideas have been worked up over the last five years in collaboration with the local communities www.oxfordfutures.org. The principle of upgrading under-used railway lines as a first step has been accepted by the National Infrastructure Commission, and a spatial growth plan is at last being commissioned by the local authorities. Instead of new housing being scattered around the countryside, we proposed that strategic planning concentrates development in compact cities, as on the Continent, and makes the most of under-used infrastructure and land, as in Germany, for example. Integrated transit systems that provide for safer cycling and reliable local transport should offer far better returns in terms of the three E’s that grand long-distance projects or ephemeral Autonomous Vehicles. Development Corporations can deliver better results faster than either local authorities or private developers on their own. Looking and learning from cities that have done much better than their British equivalents suggests how to go to scale. In Sir Peter Hall’s last book, which I helped him write, Good Cities Better Lives: how Europe discovered the lost art of urbanism’ we provided a modern Cooks Tour of places that can provide inspiration, looking in turn at transport, housing, the economy and the environment. Though very different, the stories of medium sized cities like Freiburg or Kassel in Germany, Montpellier in Southern France. Malmo in Sweden or Amersfoort in the Netherlands show how medium sized cities can change direction for the better, given the right municipal leadership. Some of the lessons are being applied in Cambridge and Manchester, as plans for combined authorities seek to coordinate investment in transport and development and to secure better value from public investment. Recently a report for the Greater London Authority called Capital Gains: a better land assembly model for London, showed how London could replicate past successes, such as the post-war Comprehensive Development Areas and New Towns if it had stronger compulsory purchase powers in Land Assembly Zones. Cities as diverse as Portland Oregon and Freiburg Germany provided case studies. We can also learn from cities such as Singapore and Palo Alto/San Jose in Silicon Valley that rank high in the Smart Cities indices, and which forms the subject of my next report. Singapore uses the powerful slogan of creating ‘the city in a garden’ for how it is integrating town and country, as Howard sought to do over a century ago. A commission from a Chinese developer based on Hangzhou, South of Shanghai, who had visited Cambridge and Milton Keynes as well as Letchworth Garden City, led to my presenting at their annual conference. They now appreciate the need to endow local trusts with assets to build more resilient communities, and avoid over-dependence on the private car. Smarter Urbanisation, or SURGe as I term it, means catching the tides. Rather than arguing endlessly over every development proposal, cities need to identify areas for growth or regeneration, starting with places that are natural junctions, as these will have the best long-term prospects. Furthermore, instead of simply ‘following the market’, which almost inevitably leads to sprawling or ‘fat’ cities, resources should be targeted at the medium sized towns and cities where the ‘smartest’ people tend to work. Though seemingly elitist, by sharing in land value uplift from development, and by ‘charging’ those who benefit from improved infrastructure, ‘smarter cities’ could score on the multiple criteria of three E’s, and overcome the weaknesses of our failed systems. The fastest growth is now in China and India, which are feeling the combined impacts of climate and demographic change. How can we in Britain, seemingly paralysed by a pointless debate over Brexit, do anything useful to shape the future for succeeding generations? I am trying in a small way, both in my efforts along the CamMkOx Arc, as the National Infrastructure Commission has called it, and through an experimental project in Southern India. In both cases the idea is to work through concerned and committed people in cities where universities play a key role, and which are also transport hubs. 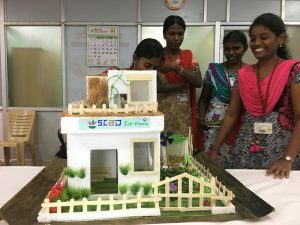 I am personally funding the building of some experimental houses in collaboration with a group of colleges called SCAD (Social Change and Development) based around the Tamil Nadu city of Tirunelveli. 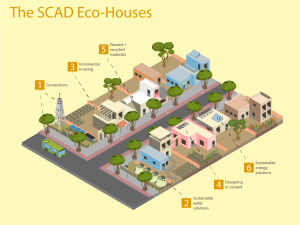 The next stage involves scaling up the initiative to save water and energy, and enable those on lower incomes to access better housing. I would welcome interest from anyone who has time or expertise to contribute as we seek to test our the principles in both Southern India and in the UK over the coming years.